Swedes are proud of their culture and their heritage. Every year, Swedish museums offer outstanding seasonal exhibitions that are both well researched and well presented. There is also a true wealth of museums: ranging from the beautiful theater museum in Drottningholm to railroad museums to science and technology museums. In fact, visitors are often surprised to find that there are enough museums in Sweden to match nearly every interest, no matter how unique or unusual that interest may be! There are over 70 museums in Stockholm alone with over 9 million visitors to these museums every year. If you decide to visit one or two museums in Stockholm every weekend, it will take you one year to visit them all! The Vasa Museum was inaugurated in 1990. 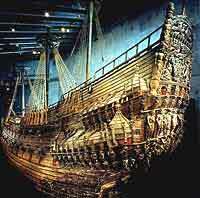 In the large shiphall, stands the warship Vasa - the only remaining, intact 17th century ship in the world. The lower rig has been rebuilt, complete with masts, stays and shrouds, just like the Vasa would have looked like when set for winter in harbour. The wreck, salvaged in 1961, is now once again a complete ship. Even if you have no interest in maritime history, this museum is well worth the visit. Since this museum is very busy in the summer, now is a good time to see it. Experience the medieval Stockholm through brickhouses, sheds, workshops, harbour and gallows. Here you find the town wall, circa 1530, and the Riddarholm ship with its cannons, cannonballs and gunpowder. Temporary exhibitions. Museumshop. Swedish technology and industrial history. Science center. Experiment stations. Teknorama: Stockholm's own hands-on exploratorium for children. Three large exhibit halls filled with interesting and fun experiments for all ages to try. Why not take grandma and discover how to make a TV show in the TV studio or let a friend raise you up using a giant screw. The Royal Armoury is an award-winning museum situated in an atmospheric cellar vault beneath the Royal Palace in Stockholm. 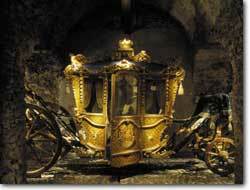 Our collections promise magical encounters with Sweden's royal history, for everyone from 9 to 99. 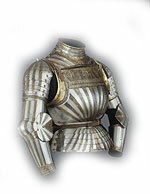 The are magnificent costumes in gold-brocade from coronations and royal weddings, gilded carriages, weapons and armour. Inside, you will find Gustavus Adolphus' bloody shirts, elk-hide buff coat and horse from the Battle of Lützen in 1632, Charles XII's muddy uniform from the siege of Fredriksten fortress in 1718 and the masquerade costume worn by Gustav III at that fateful masked ball in 1792.